How is the draft experience different on Sleeper? The draft experience in Sleeper leagues is much more intuitive than other platforms. 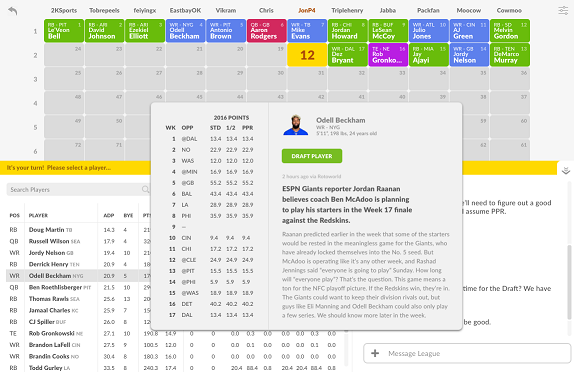 Sleeper draftboards give you a modern interface where you can quickly see exactly what is going on from all of the teams in your draft. No more old list UIs where you don't have context of what is going on during the draft and only see the last few picks. Save time tabbing around to find the information, and use that precious time making strategic moves! Our draftboards are fully controllable, meaning your commissioner can start, pause, resume the draft at any point in time, edit mistakes that might have been made without having to email support, or manually enter a draft or allow CPU to auto-draft any particular spot. You can set draft timers, control day and night themes, and even cast the draftboard to a big screen TV for live draft parties! Best of all, the experience is seamless across both web and mobile.